This is the landing page for conspiracy files volume 1 - the DC vents, Hearst tower, and Alamo. I apologize for not catching the fact that most (if not all) of the response e-mails with access links got censored sooner than I caught it. As usual, since this is behind a pay wall please do not re-post this elsewhere until at least December. 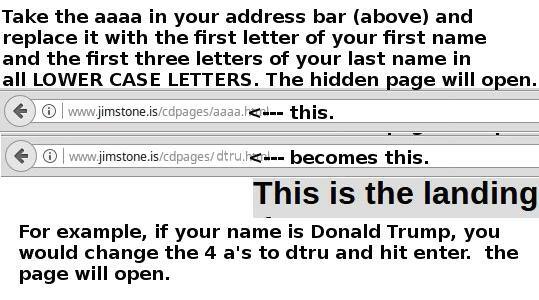 To access your page, put the first letter of your first name, plus the first three letters of your last name (as they appear in Paypal) IN ALL LOWER CASE, in the place of the 4 a's in the page name in your address bar and hit enter. UPDATE: make sure you delete the 4 a's and replace them, and do not delete anything else or it wont work. It will open the hidden page. For Example, Mike Johnson would be entered "mjoh" To those who helped, thanks! for those who donate via Paypal with a business account use the first four letters of the business account to access the page. Unfortunately, since all my communications are censored, I have to resort to methods like this. I really did not think they would censor the mails if someone paid for something, but they did.